Litha, or summer solstice, is the peak of the summer sun, and the time when the sun’s strength begins to wane. In some traditions it is one of two times per year when the Oak King and the Holly King battle for dominance. At summer solstice the Holly King emerges victorious and rules over this half of the year until he is defeated at winter solstice by the Oak King. It is also associated with Faerie energies, and is a perfect time to work with faerie magick in the forms of divination and creativity. During our ritual, to help us focus on creative and divinatory energies, we charged hazel twigs that had been bound with purple and yellow ribbon. Hazel is strongly associated with both divination and creativity, and within my coven’s tradition is the tree associated with the month of June—and therefore is the perfect companion for solstice faerie magick. 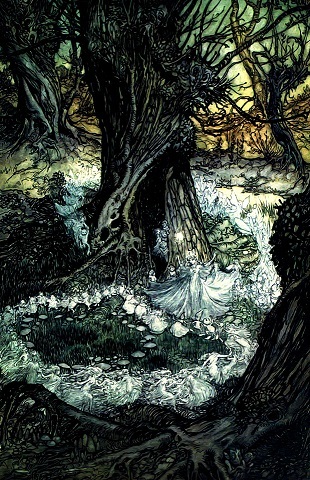 We delved further into the Faerie energy by reading passages from the Ted Andrews book Enchantment of the Faerie Realm. Within this book he has a “checklist” of experiences that, if you’ve had one or more of them, could signify you’ve had a brush with the Faerie Folk. Everyone enjoyed reading these and thinking about their own experiences, as well as discussing them further after ritual.